Watch the Video Yes. Dedicated customer service rep. Unlimited support. No dedicated rep. Help documents, email, knowledge center, request a call back. Watch the Video Very flexible. 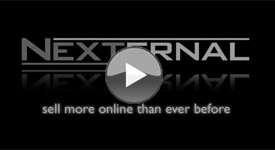 Nexternal will make your store look like the rest of your site. Have to work within their Template Manager. QuickBooks Integration Order data can be exported to a QuickBooks .iif file. Not Available. Reporting Robust. Significant reporting capability. No. Bulk Email Wizard Yes. No. Passes to Constant Contact. Comparison Shopping Site Feeds Automated - run daily. Must manually create and submit data files. Customer Based Pricing Yes. No. Product Import Yes. Import Data from an Excel spreadsheet No. Bulk Order Processing Yes. No. Information was collected from Amazon's website (webstore.amazon.com) in order to compare it to Nexternal's shopping cart application. To report an error or discrepancy, please email .